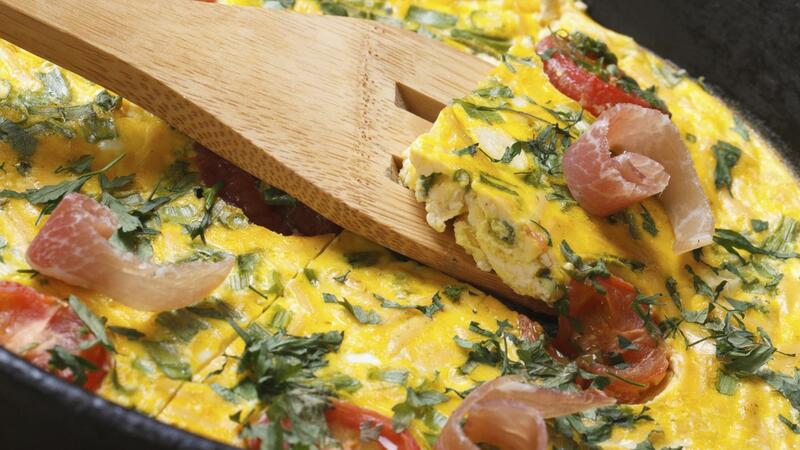 What Is a Recipe for an Easy Make-Ahead Breakfast Casserole? An easy recipe for a make-ahead breakfast casserole contains sausage, eggs, milk, spinach, cheese and herbs. The casserole is assembled and refrigerated until the next morning. Gather and prep all breakfast casserole ingredients before assembling the casserole. Brown 1 pound of pork sausage. Use spicy, mild, regular or turkey sausage according to desired taste. Drain the sausage, and set it aside. Whisk together four large eggs and 2 1/4 cups milk. Use low-fat or skim milk to reduce calories, if desired. of mushrooms. Add the spinach and mushrooms to the milk and egg mixture. cheeses to the milk, egg, spinach and mushroom mixture. Add 1/4 teaspoon dry mustard to the mixture. Add salt and pepper to taste. Mix well and set aside. unseasoned croutons on the bottom. Spread the browned sausage over the croutons. Next, pour the liquid mixture over the sausage. Refrigerate the casserole overnight. In the morning, preheat oven to 325 degrees Fahrenheit. Bake casserole approximately one hour or until the top is brown and bubbly. Remove from oven and garnish with parsley sprigs before serving. What Is a Recipe for a Sausage Breakfast Casserole? What Is the Best Breakfast Casserole for a Family of Five? What Is an Easy Breakfast Casserole Recipe? What Is an Easy Recipe for Making Sponge Cake? What Is an Easy Recipe for German Pancakes? What Is an Easy Recipe for Onion Rings? What Is a Recipe for Crock-Pot Breakfast Casserole?